The strait stretches in a roughly northeast/southwest orientation, with a minimum width of 24 km (15 mi) at its northeastern end between Cape Tua on Sumatra and Cape Pujat on Java. It is very deep at its western end, but as it narrows to the east it becomes much shallower, with a depth of only 20 m (65 feet) in parts of the eastern end. It is notoriously difficult to navigate because of this shallowness, very strong tidal currents, sandbanks, and man-made obstructions such as oil platforms off the Java coast. 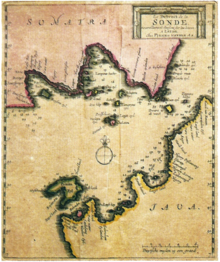 It had been an important shipping route for centuries, especially during the period when the Dutch East India Company used it as the gateway to the Spice Islands of Indonesia (1602-1799). However, the strait's narrowness, shallowness, and lack of accurate charting make it unsuitable for many modern, large ships, most of which use the Strait of Malacca instead. The strait is dotted by a number of islands, many of which are volcanic in origin. They include: Sangiang (Thwart-the-Way), Sebesi, Sebuku, and Panaitan (Prince's). The most famous volcano, however, is Krakatoa, which exploded in 1883 in one of the deadliest and most destructive eruptions in recorded history. The islands in the strait and the nearby surrounding regions of Java and Sumatra were devastated in that eruption, primarily due to intense pumice fall and huge tsunamis caused by the collapse of the volcano. The eruption drastically altered the topography of the strait, with as much as 18–21 km³ of ignimbrite being deposited over an area of 1.1 million km² around the volcano. Some areas, such as the coastal region of Java now incorporated into the Ujung Kulon National Park, have never been resettled, but much of the coastline is now very densely populated. Aside from Krakatoa's sole remaining peak, Rakata, the Krakatoa Archipelago consists of the islands of Lang (Panjang or Rakata Kecil), Verlaten (Sertung), and most recently, Anak Krakatau, which emerged in 1927 from the original Krakatoa's shattered remains. On March 1, 1942, the Battle of Sunda Strait—part of the larger Battle of the Java Sea—took place when the Allied cruisers HMAS Perth and USS Houston encountered a Japanese amphibious landing force near Bantam, commanded by Rear Admiral Kenzaburo Hara. That force included a light cruiser and eleven destroyers, four heavy cruisers and a light aircraft carrier. The two Allied cruisers were sunk, while a Japanese minesweeper and a transport vessel were sunk by friendly fire. In the 1960s proposals were made for a bridge across the Sunda Strait, and in the 1990s further suggestions arose. A new plan was announced in October 2007. It would use the islands of Ular, Sangiang and Prajurit to create a four-part suspension bridge reaching 70 metres (230 ft) above sea level. This bridge would have a maximum span of 3 kilometers, nearly 50% longer than the current record holder, the Akashi Kaikyō Bridge. Construction was projected to begin in 2014 if funding of at least US$10 billion could be secured. An accord was signed in April 2012 with China Railway Construction Corporation for an $11 billion road and double track rail bridge. However, in November 2014 the incoming government of President Joko Widodo shelved plans to build the bridge. ^ a b Donald B. Freeman, The Straits of Malacca: Gateway Or Gauntlet?. McGill-Queen's Press, 2006. ^ L, Klemen (1999–2000). "Rear-Admiral Kenzaburo Hara". Forgotten Campaign: The Dutch East Indies Campaign 1941-1942. ^ Visser, Jan (1999–2000). "The Sunda Strait Battle". Forgotten Campaign: The Dutch East Indies Campaign 1941-1942. Archived from the original on 2014-12-03. ^ Forbes, Mark (October 5, 2007). "Bridge plan to link Java and Sumatra". The Age. Melbourne. ^ Satria Sambijantoro, 'No more Sunda Strait Bridge plan', The Jakarta Post, 3 November 2014. See also 'New Government Will Not Prioritize Sunda Strait Bridge Project', Global Indonesian Voices, 2 November 2014. This page was last edited on 2 March 2019, at 06:23 (UTC).